Suspends the issuance of visas to people in countries designated “particular concerns” for 60 days. Bans all people from “areas of concern” for 90 days. The White House has indicated that those areas are Iran, Iraq, Syria, Sudan, Libya, Yemen and Somalia. Although 9/11 is specifically invoked in the order, none of the 9/11 terrorists were from these countries. Nor does the list include countries from which several post-9/11 terrorist hail. The list also omits Muslim-majority countries where Trump has business interests. Suspends admission of refugees from any country for 120 days except in limited circumstances, such as being a religious minority (that is why Christians in Muslim-majority countries will get preferential consideration for refugee status). After that, refugees will only be admitted from countries jointly approved by the Department of Homeland Security (DHS), the State Department, and the Director of National Intelligence. Blocks refugees from Syria indefinitely. Prohibits the U.S. from admitting more than 50,000 refugees annually. Suspends the Refugee Resettlement Program for 4 months. The order generally suggests that these actions are being taken so that the “vetting” process for people from terrorist-prone countries can be analyzed and improved. Immigration experts note, however, that these vetting procedures are already quite thorough. The ACLU and other groups have filed lawsuits alleging that the bans are unconstitutional and have been granted limited temporary stays of further detention and deportation of those who arrive on our shores. It is unclear if courts will agree on the order’s constitutionality. Congress broadly authorized the President to suspend the entry of anyone. In addition, the order is directed at people from certain nations, not at Muslims, making it tougher to prove that the ban intentionally discriminates on the basis of religion. Moreover, although another law passed by Congress in 1965 prohibits discrimination when visas are issued, it is not clear if that law applies to entry decisions made by the President. Lastly, courts follow the “plenary power doctrine,” which provides that Congress and the President have the exclusive power to regulate all aspects of immigration and that courts must generally refrain from weighing in on immigration policy. Religion is, nevertheless, a bedrock principle. Accordingly, courts may look at statements made on the campaign trail about banning Muslims and the rather dubious selection of countries and find that the ban is intentionally directed at Muslims and simply too repugnant to ignore. In short, it is not clear how courts will come out. Congress clearly can, however, pass legislation that overrides an executive order. Such legislation would be subject a veto that can only be overridden by a 2/3rds vote of Congress. And it may be impossible to get those numbers in this Congress. But I am not one to back away from a challenge. Here are suggestions for those who are similarly disposed. CONTACT YOUR MEMBERS OF CONGRESS. Call, fax, email, and write. You only have three elected officials in Congress, so send all three of them a new communication every day. Reference your prior communications. If you do not know the names of your representatives, there are websites and apps that you can use to locate that information. If you want to call your elected officials at their D.C. offices, you can dial the Capital switchboard at 202-224-3121. Prompts will connect you to the correct offices. But it is best to know whose office you will reach ahead of time. My name is [———] and I live in [official’s] district. I am opposed to the January 27 executive order that bans immigrants and refugees from seven countries and Syria. It is discriminatory, and we are a nation where freedom of religion matters. We are also a nation of immigrants and this ban does not reflect the spirit of inclusion present in our district. I want [official] to do everything in [his or her] power to stop this. I want [official] to pass legislation overriding the executive order, or maybe repeal the President’s authority to ban people. I want [official] to do something. BEFORE calling, check to see if your elected official made public statements about the Muslim ban during the election (indeed, a number of republicans have already spoken out). [Ed: Vox.com is maintaining an updated list here]. If they have made statements condemning the ban, CALL ANYWAY and praise them for doing so. If they have made statements supporting the ban, CALL ANYWAY and criticize their support. Ask them to change their minds. If they have said nothing, ask them to make a statement condemning the ban. IF YOU CAN, SEND A FAX. Faxes are delivered as quickly as emails but garner more attention. Plus, faxes do not get held up in security screenings like envelopes. On-line style guides can show you how to format and address formal letters to officials. And although you should follow those style guidelines, the content should reflect your heart and experience. Do you know a refugee? Do you volunteer with any refugee groups? Are you a believer in religious liberty? Why are you so upset about this ban? Your letter need not be lengthy, but it can and should be personal. CONTACT THE DEPARTMENT OF HOMELAND SECURITY. Call Secretary John Kelly via the DHS public comment line at 202.282.8495. Tell him that you oppose the Muslim ban. In the past, Kelly has endorsed a more reasonable approach to securing the borders. During his confirmation hearing, he vowed to promote tolerance and oppose targeting people solely on the basis of their religion or ethnic background. Ask him to stand by that promise. PETITIONS, especially form petitions, are never a substitute for letter writing and phone calls. But they take virtually no time to sign. Here are two that were drafted before the executive order was signed and thus might be a little dated. (petition 1, petition 2) Sign them anyway and look for others created after Friday. Or start a new one. TWEET @realDonaldTrump & @POTUS and use #firsttheycamefor to show your support for refugees and other vulnerable people. You can also send the White House a Facebook message at Facebook.com/WhiteHouse. Simply state your opposition to the executive order. Ask Trump to reconsider. RECRUIT REPUBLICANS. The toughest task, but worth the effort if you know republicans with whom you can have reasonable discussions. Appeal to their sense of fairness and our country’s history as a nation of immigrants. Note that the ban creates a false sense of security given that it targets the wrong countries- none of the 9/11 terrorist were from the countries targeted in this ban. None of the major post-9/11 acts of terror were committed by people from these countries either. Explain that this mismatch makes our country look misinformed at best, and prejudiced at worst. Perhaps they will meet you halfway and agree that because of this mismatch, this ban is no good even if they like the idea of a ban generally. Point out the negative impact of this ban on people, including green card holders and vetted refugees, who were travelling when the executive order was signed. If they will not agree that all bans are bad, or that this ban is bad, maybe they will at least agree that this ban was poorly implemented and that important nation-impacting policies should be carefully crafted. A policy change should not cause chaos. ORGANIZATIONAL SUPPORT. Immigration is a specialized area and there are local and national groups who have been doing this work for a while. Join or support them. Send donations. Follow them on social media. Share their posts and newsletters. Call and ask how you can help. Also consider supporting the ACLU and the National Lawyers Guild who are heading up litigation efforts and mobilizing protests at airports. 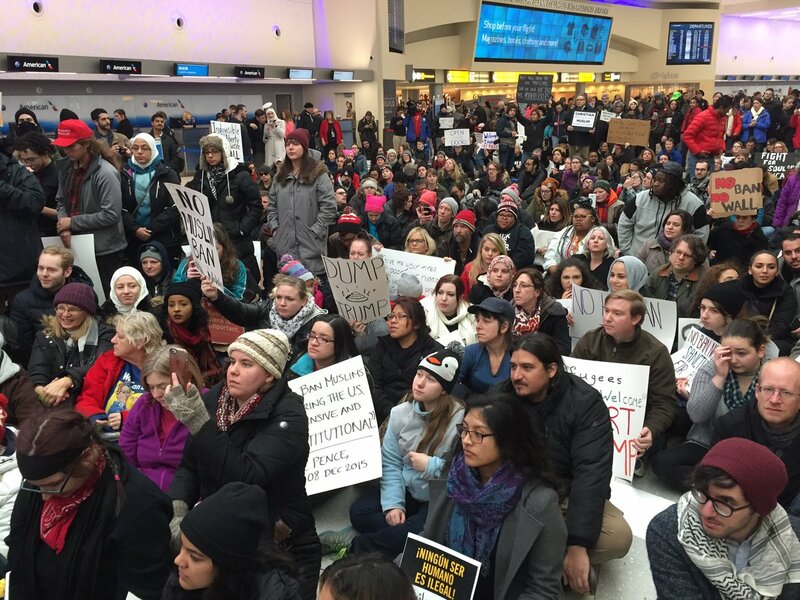 Ask friends living in cities like New York, Los Angeles, and Dallas to consider protesting at airports. Those protests have been invaluable. PERSONAL SUPPORT. If this order personally impacts you, please know that you are not alone. We stand with you. If you are not personally impacted, consider reaching out to people who might be. Let them know that you care. Listen to their concerns. Ask them how you can help. Find out if they want to do something and help them do it. If you do not know anyone impacted by this order, explore your community. Visit a Muslim community center. Attend a talk at your local university. Seek out art and music associated with Muslim countries or created by Muslim artists. Read a book. *As of this writing, the White House has not released an official copy of the order. J.M. Burke is a lawyer who teaches Constitutional Law and Criminal Procedure while currently pursuing a PhD in Criminology. A 2001 graduate of Boston College Law School, she has practiced civil and criminal law, published scholarly articles, and performs pro bono services through several organizations. FAQ: The Trump Executive Order On Immigration Didn’t Trump Get The Memo?